"Kids will love storing their special toys in this bag." For a beautiful and bright Easter basket that youngsters will cherish forever, the Warmhol Easter Egg Basket Bunny Burlap Bag is a great pick. Crafted from natural jute fiber and cotton, it’s both eco-friendly and durable. Plus, the bunny pattern is plainly adorable! 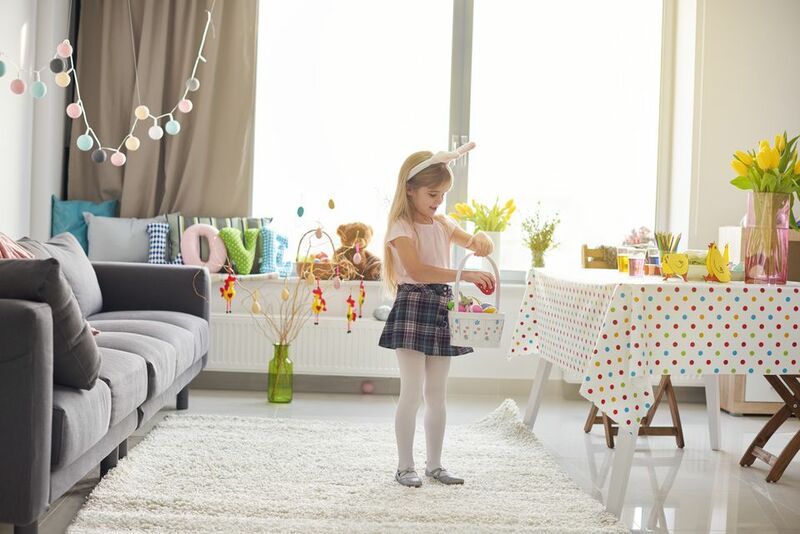 After the Easter festivities, use it as a backpack or a storage basket in a bedroom or playroom. Kids will love storing their special toys in this bag. The Bunny Burlap Bag is available in vibrant shades of green, blue, purple, and pink and measures 9.5 x 9.5 inches. In terms of caring for the bag, just be sure to keep it away from water. These eggs aren’t for eating, but they will crack little ones up and teach them a thing or two as well. The plastic set comes with six eggs in a cute, bright egg carton. Each one is decorated with a unique fun face and cracks open to reveal a brightly colored, matching chick inside. Press down on a chick’s head, and the sweet chirping begins. No batteries are necessary. Recommended for ages six months and up, they're great for babies and toddlers and are a fun foray into teaching colors, counting and more. Still can't decide on what you want? Our round-up of the best gifts for toddlers can help you find what you're looking for. For tweens and teens, this Bunny Kingdom strategy game is full of serious fun! It’s all about building the best kingdom for your clan of plastic bunnies. Players do this by drawing cards and moving around the 100 squares on the game board. After four rounds, time is up, and the player with the most points wins. This bunny-themed card game is designed for kids ages 14 and up and can be played by two or four players at a time. It’s fun, challenging and is sure to get pulled from the game shelf often for year-round fun. For more card games that tweens can enjoy, check out our favorite family card games. For an Easter-themed gift that the kiddos are sure to love, the Jellycat Bashful Beige Bunny is a great option. The Bashful Bunny is irresistibly cute, with its long, floppy ears and snuggly body, and it’s perfect for both girls and boys. It's available in sizes ranging from Tiny (5 inches) to Really Really Big (50 inches), and everything in between. Reviewers love this stuffed bunny, calling it “incredibly soft but able to handle almost constant loving cuddles." From naptime to imaginary play, this stuffed animal is sure to be well loved over the years. And it makes a great gift from grandparents who want to spoil their own little bunnies! For the grade school crowd, it’s hard to go wrong with a lego set, especially when the end result is an adorable, yellow chick. With more than 110 pieces in all, building it is a great way to burn off some of that jelly-bean-fueled energy. With a rotating head and body as well as movable wings and toes, it’s a lot of fun to play with too once the chick is built. The pieces are, of course, compatible with all other Lego sets as well, so who knows what kind of adventures they can create for this crazy chick. This set is recommended for ages seven and up. There’s just something about slime that kids can’t get enough of, so imagine their delight when they find eggs in their basket filled with this marvelous substance. This set comes with six plastic eggs, each of which is filled with soft, stretchy slime. They’re perfect for hiding, sticking in baskets or as party favors. The slime comes in a variety of colors and is peppered with small beads and pearls to make it even more mesmerizing. The eggs make a great way to store the slime too when it’s not being used. They’re recommended for kids ages five and up. While the slime is safe and nontoxic, you still don’t want little ones to eat it. To sneak in a bit of learning in the basket, there’s this Bunny Hop memory game. The goal is to collect one bunny in each of the four colors (there are 20 plastic bunnies in all—five each in red, blue, yellow and green) first. Players do this by rolling a die and pressing a bunny in a matching color, hoping to find a “hopper.” If the bunny hops out of its hole, the player gets to keep it. The award-winning game teaches kids color recognition and memory skills, but, mostly it’s just a whole lot of fun. The recommended age is three to six years, but it’s a lot of fun for the whole family to hop into together. It’s a fun and stress-relieving activity when you want to take a break from a busy day. Paired with a pack of colored pencils or markers, this coloring book makes a great, inexpensive addition to any basket. This book makes a sweet gift for those who want to embrace the religious reason behind Easter. Featuring a small polar bear and her family, they delve into the story of Jesus and how he died and rose again. It touches on prayer and heaven, but at a level that kids can understand. It’s a great introduction to help them recognize that Easter goes beyond their basket. Recommended for ages three to seven, it’s a good one for preschoolers who have lots of questions. The fun watercolor and colored pencil illustrations and characters keep their interest while the meaningful lessons are delivered.